After spending more than 40 hours on research, weighing different customer feedback, and following up on community discussions, we are more confident that New Balance 928v3 for men and for women are the best shoes for walking on concrete all day. The mid-foot cushion, the flexible ROLLBAR motion-control design, and the strong outsoles provide the comfort and safety your feet need when you are too busy to stop. The 928v3 comes only in two colors: black and white. And although there aren’t many color options to choose, the two should complement your casual outfit and professional wear quite well. 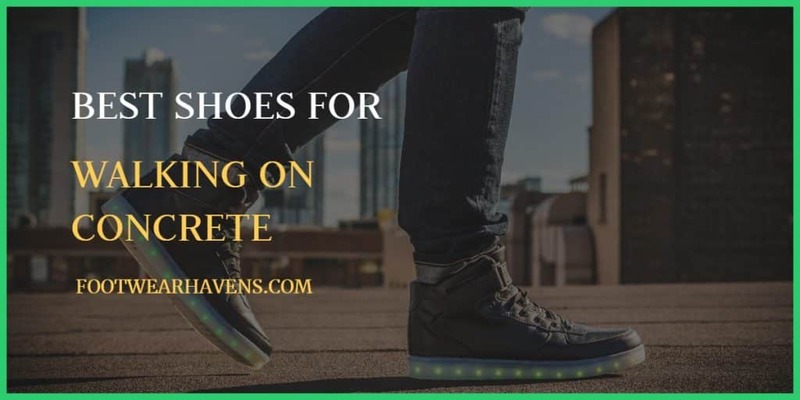 What Should I Consider Before Buying Shoes for Walking on Concrete Floors? What are the Best Shoes for Walking on Concrete All Day? You cannot walk on concrete floors for long hours without the most comfortable footwear. Shoes with thin outsoles and saddles that wear and tear fast can’t do your feet any good on such surfaces. And while you might walk a mile or two – or maybe more – just fine, you put your feet at more risk of an injury the same way you would if you walked barefoot. Concrete surfaces are the most unfriendly surfaces to walk on. In fact, a study conducted by Hill Runner shows that concrete is 5 times harder than asphalt and therefore not human friendly. Unlike softer floors, concrete surfaces concentrate all the impact pressure on your body’s joints every step of the way. So without proper footwear, you might end up suffering from chronic joint injuries. A good pair of shoes for concrete has two advantages. First, they protect your feet and joint from possible injuries by managing most of the pressure and impact originating from the hard surfaces. Second, they protect and improve your orthopedic health. With more than a dozen shoe brands out there, and hundreds of pairs to choose, it seems obvious that you are spoiled for choice. But the problem is, choosing the right type of shoes for concrete isn’t anything like choosing the most fashionable shoes. So before you spend your money on a pair, consider the following factors. Just because a pair of shoes is pricey doesn’t mean it is comfortable enough to get you through the day. And even cheap ones can be somewhat disappointing if used on concrete floors. Go for a pair of shoes that creates a perfect tradeoff between cost and comfort. Lightweight shoes are always better, but make sure they have a flexible midsole and durable outsole that can stands up against hard surfaces well enough with every step you take. Shoe breathability has always been underrated, but it’s one of the features to consider before spending your money on any footwear. It doesn’t make sense to walk in shoes that don’t allow air to flow around your feet and expect to get through the day. Choose breathable shoes because they allow air to flow easily around your feet to keep them cool and sweat free. Moreover, breathable shoes keep soggy socks and hotspots at bay while protecting your feet from blisters. The ability to walk freely and comfortably on concrete floors for long hours isn’t the only thing you should care about, to be frank. It is also important to consider your arch when selecting a pair. Go for shoes that offer solid arch support, as they improve your overall comfort on hard surfaces for a long period. Do not concentrate too much on the support the shoes give the bottom of your feet to forget that the upper part needs sufficient movement for complete comfort. The shoes you choose should provide both bottom of the feet comfort and have flexible uppers. Shoes with flexible uppers give the parts of your feet that need to move the freedom to do so all the time. Asics Gel Tech Walker Neo 4 not only protects your feet from possible injuries but also minimizes the chances of your feet developing blisters and calluses. The brand uses a simple design approach to make Neo 4 suitable for sports and casual outfit. And although the Neo 4 isn’t as flashy as some classy models on the market, they are up to standard and good enough for long periods of walking. 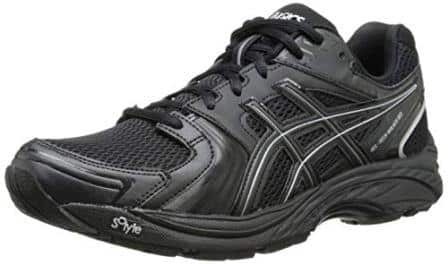 Asics implements their footwear’s Gel Cushioning System to make these shoes easy on feet and comfortable for long hours of walking especially over a long distance. Because Gel Tech-Walker Neo 4 provides adequate arch support when walking, they make a solid choice for people who have flat arches and walkers with plantar fasciitis. The breathable upper improves air circulation around the feet and the medial window helps to ease pressure on feet. The Gel Cushion System is good enough to protect your feet against impact from concrete floors. Moreover, the Neo 4 is quite easy on foot problems and often recommended for people suffering from chronic arthritis. New Balance implements a motion control technology to bring out a pair of shoes suitable for women who spend a lot of time on their feet, especially during busy shifts. Designed to offer stable feet support even on unleveled ground, New Balance 847v3 Walking Shoes are a good fit for women who have issues with instability. They also feature a Rollbar system, which provides excellent support to prevent supination as well as overpronation. Built to last for years before you can think of a replacement, you can walk in these athletic for a very long time without noticing any trouble. Thanks to the walking strike path technology built-in, you get total foot stability and body balance while walking. ABZORB is another special technology built-in into these shoes to protect your feet from stink, suffocation, and sweat. The shoe collar and tongue have ortholite foam, lightweight enough to reduce stress levels on your feet. These shoes are, therefore, good for women who always walk for long distances every single day. The New Balance 847v3 models have an edge over many athletic shoes on the market because of their orthopedic inserts. Thanks to these inserts, these shoes can be used even by people who have spinal cord issues. Patients currently undergoing gait correction therapy will also find the 847v3 useful. Designed with men who suffer from neuropathic pain in mind, Skechers Performance Men’s Go Walk 3 dress shoes remain easy on achy joints and can help to ease knee discomfort. These shoes are made of materials taken from yoga mat through the GOga mat technology. And they are well cushioned to handle impact from concrete surfaces. The GoImpulse technology, together with GOga pillar technology and a 1.5” cushioned heel, provides the comfort you need to move around for long hours. The mesh design makes the shoes more breathable, allowing for more airflow throughout the day. So you do not have to worry about your feet getting sweaty or wet from walking for long distances. Skechers Performance Go Walk 3 falls into the category of the most comfortable work shoes for walking on concrete all day, weighing only 1.9 lbs. That’s because they are made from lightweight materials, including memory foam and Resalyte. The mesh design also contributes to the lightweight aspect of this pair. More importantly, it boosts the comfort of your feet for longer period when walking. 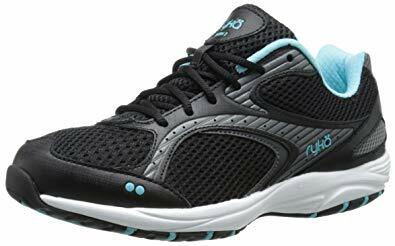 If you are looking for the best tennis sneakers for walking on concrete floors, pavements, and occasional dirt trails, go for Ryka Women’s Dash Walking Shoes. 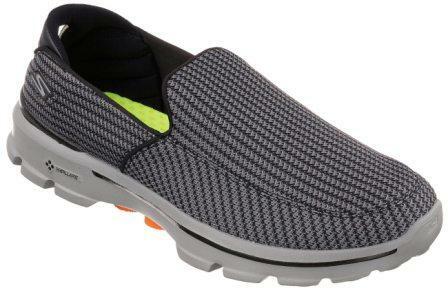 Ryka Dash walking shoes have rubber outsoles that provide your feet with maximum flexibility and traction. The ortholite footbed provide your feet with all-around comfort, making these shoes the best option for regular fitness walkers as well as busy women who keep on their feet all day. These shoes are also good for bunions because they have a good width at the metatarsal joints. Ryka Dash walking shoes are easy to clean, so it shouldn’t take you more than an hour. Remove the insoles, wash them in the shower or basin, and then air them to dry. If you don’t want to dip them in a bowl full of water, you can dust them with a wet washcloth and a bit of soap and then dry them in the sun. If a combination of style and comfort is anything to go by, CLARKS has created a perfect tradeoff between both. This design approach brings out the best slip-on loafers that you can walk in on concrete surfaces. Featuring a lightweight ventilated body with solid cushioning, the Cotrell Slip-on Loafers are arguably the right shoes to wear when you are too busy to stop, particularly during long shifts that require you to walk a lot. Because these loafers have flexible, synthetic soles, they add to the shoes the responsiveness your feet need to stay in proper contact with the hard floors. The slip-resistant, smooth outsole eliminates the chances of falls and slips, so you do not have to worry about foot and knee pain from walking on concrete. The undersides and the insides of these loafers are well padded with foam to give your feet the comfort you need to walk with ease. Given that the leather upper is breathable, there’s some good airflow to prevent feet sweat. The upper doesn’t stain easily and it is so easy to wipe up. CLARKS Cotrell Loafers are hands down the perfect pair to wear when you are too busy to stop. Although they are easy on the wallet, they might run half-a-size smaller if you choose a size you normally would when buying other type of shoes.